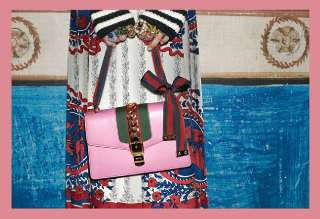 Gucci's excellence dwells on its tradition of luxury and a constant quest and attention for quality and style. The brand creates and distributes high-quality luxury goods, including ready-to-wear, handbags, luggage, small leather goods, shoes, timepieces, jewellery, ties and scarves. Also, under license from global industry leaders, eyewear and fragrances, cosmetics and skincare products. This vast product range and the sharing of specific expertise among the various brands are one of the Group\'s greatest assest and a source of organic growth.